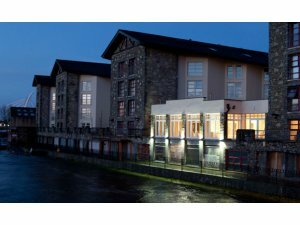 The Management and Staff would like to welcome you to The Ballina Manor Hotel, centrally located in Ballina Town, the ideal setting for exploring the many treasures that Mayo and Sligo have to offer. Located on the Banks of the River Moy, the Hotel boasts spectacular views onto the World Famous Ridgepool and Cathedral Beats, which are bustling with fisherman during the Fishing season. The hotel has a modern, contemporary theme throughout and is designed with your comfort & convenience in mind. 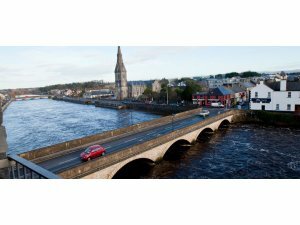 Enjoy being in the centre of Ballina while delighting in panoramic views of the Moy River from our restaurant Pink Salmon, our cocktail bar, The Bentley and our many river view bedrooms. While staying with us, why not enjoy a relaxing meal in our restaurant Pink Salmon overlooking the river Moy or the Bridge Tavern, or unwind in our fully equipped Leisure Centre . There is free WiFi throughout the building and complimentary carpark with an overflow carpark across the road. Whether your stay with us is for Business or Leisure, there is always a warm welcome awaiting you, from our dedicated team of staff, who are happy to assist you with any query or advise you of places of interest to visit. Each of our Luxurious bedrooms are beautifully designed with your relaxation in mind. 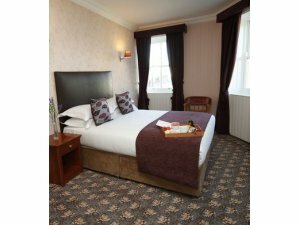 Every consideration has been taken to ensure your comfort, with Modern Soft Furnishings and Furniture, Crisp White Linen and Towels, selection of Toiletries, and Bath & Power Shower. Everything is provided, and nothing is over-looked, as we strive to ensure that you enjoy all the convenience of home, away from home. As we’re right on one of Ireland’s most prominent salmon rivers, we’re really committed to fresh fish and fresh produce. Here at the Ridgepool, we’d be delighted to cook your catch for you. So, no tall tales about the weight of your catch as we can serve it up on a platter for you and your family and friends! With views right onto the Moy and the cathedral in the background, this truly is a sumptuous dining experience. Whether for a long lunch or a memorable evening meal, dine at the Ridgepool and experience modern Irish dining like never before. With traditional music on several nights a week and a cosy atmosphere on cold nights, we know you’ll have a great night in our Bridge Tavern and bistro. So, whether boasting about your catch of the day or planning the next day’s events and activities, why not do it here. Our fitness centre including gym and swimming pool will be open from early morning to evening time. So, if you feel like a swim but cannot face the might of the Atlantic, our 15 ft pool is just right for you, allowing you to unwind after a long conference day or get in a swim before taking off with the children for the day. We also have a well-equipped gym on the premises. From weights and rowing machines to exercise bikes and treadmills, you will certainly maintain your fitness at Ballina Manor Hotel. Complimentary drinking water is also provided to all guests. Whether you are an experienced angler or an enthusiastic beginner, the setting of the Moy river is the perfect place to enjoy one of Ireland’s oldest pastimes. As one of Europe’s top salmon rivers, Ballina and the Moy attract a huge number of fishermen and anglers every year. While the river Moy is a famous salmon river, you can also experience deep sea fishing (mackerel, cod and more) in the Atlantic nearby. Lake fishing is also very popular in nearby Lough Conn and Lough Cullin where you can find trout and pike. And remember, we‘re situated on the famous Ridgepool with direct walking access from hotel. From sorting out your permits and licences to providing you with a packed lunch - we‘ve thought of everything so you can concentrate on your fishing. Our angling facilities are second to none and we provide rods, reels and an abundance of tackle, a wet room and lockers. A gillie can be arranged from just €100 to help our anglers or we can arrange an instructor for our more inexperienced guests. 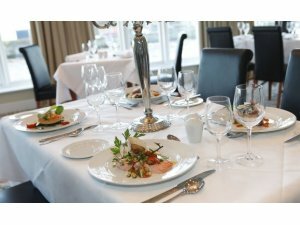 We can provide freezers for storage and would be delighted to cook up your fresh catch at our hotel restaurant - the Ridgepool. Feel free to give us a call and ask us plenty of questions. We have fishing and angling specialists on hand to answer any queries you may have. Golfing in North Mayo and the surrounding region is a real joy. Championship courses with magnificent scenery will challenge even the most accomplished golfer. From the great links courses of Enniscrone and Carne to the excellent Ballina Golf Course option in Ballina, experience Ireland’s golfing culture at its best. At the Manor Hotel, we’ll advise you on all the best courses the region has to offer and so much more. We can also organise tee times and arrange transport for you to and from the course. Why not come back to us after your round, take in the ‘19th hole’ and have a meal or a drink in one of our bars and restaurants? The Ballina Manor Hotel is centrally located in Ballina Town on Barrett Street. Take the N4 via Mullingar - Longford. In Longford take the N5 via Strokestown - Frenchpark - Ballaghadereen - Charlestown - Swinford. In Swinford, take the N26 via Foxford - Ballina. Take the M1 until you reach the A4. Take the A4 via Enniskillen - until you reach the N16. Take the N16 via Manorhamilton - Sligo. In Sligo take the N17 Via Ballisodare. In Ballisodare take the N59 via Dromore West - Ballina. Take the N20 Via Mallow - Rath Luirc (Charleville) - Croom - Limerick. In Limerick, take the N18 via Ennis - Gort - Oranmore - Galway. Take the N17 via Tuam - Claremorris - Knock - Charlestown - N5 to Swinford - N57 to Foxford - Ballina.